Apache modspdy is an open source Apache module that allows Apache web servers to serve HTTPS requests using the SPDY protocol. SPDY (pronounced as “SPeeDY”) is a new protocol created to address speed related problems with the HTTP protocol; it allows the client and server to pass multiple requests over a single connection, compress request and response headers, and all the server to push site resources to the client without the client requesting them. Setting up SPDY on your server can reduce bandwidth usage, and decrease page load times. Please note that currently modspdy only works with HTTPS connections, and will not work with regular non-encrypted HTTP connections. Debian Droplet (VPS). This guide has only been tested on Debian 7. Apache HTTP Server version 2.2.4 or greater. To install Apache please follow the setup and step #1 of the How To Install Linux, Apache, MySQL, PHP (LAMP) stack on Debian article. Apache modssl enabled and configured. To configure Apache modssl please follow the instructions for creating a self-signed SSL certificate, or the instructions for configuring a free signed SSL certificate. To install mod_spdy you will need to download the appropriate package for the operating system. All of the commands below should be executed as the root user. Once you have the installer package downloaded, you can proceed to instruct the Debian package manager to install your newly downloaded package. Once the package has been installed, instruct the package manager to make sure that all dependencies required by mod_spdy are installed. Now you can delete the .deb package that you just downloaded. In order for your changes to take effect, you must restart Apache. 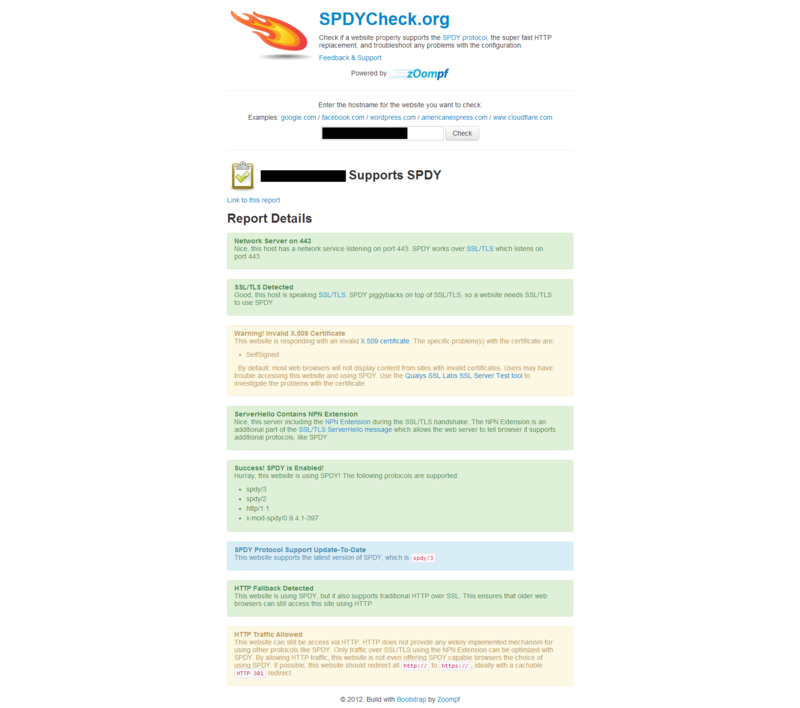 Launch a web browser on your machine, and navigate to http://spdycheck.org/, a free web tool provided by Zoompf, that will tell if your website is configured to use SPDY correctly. In the text box enter either the IP address or the hostname of your droplet, and click on the check button. Within a few seconds, SPDYCheck will deliver your results. They should appear similar to the results shown below. If the tool returns “Success! SPDY is Enabled!”, you have successfully enabled SPDY on your Apache server! For performance and security reasons, I highly recommend that you use mod FastCGI with PHP5-FPM instead of Apache modphp. Switching from modphp to FastCGI & PHP-FPM should be seamless unless you have made changes to your Apache php.ini file, which contains all of your PHP settings. PHP5-FPM and FastCGI can be installed and updated through the package manager. Before you can install the libapache2-mod-fastcgi package on your system, you must add the non-free Debian repository to your systems list of package sources. Change the two lines in that file to match mine below and save your changes. Update your systems package list. Once the packages are installed, make sure that required Apache modules are enabled. Once the required Apache modules have been enabled, open up your /etc/apache2/apache2.conf file. Add the following lines to the very bottom of the file. Now PHP-FPM and FastCGI have been installed. Note: PHP5-FPM uses a different php.ini file than mod_php. Your new php.ini file is located at /etc/php5/fpm/php.ini. If you made any changes to your old php.ini file located at /etc/php5/apache2/php.ini, then you will want to make the appropriate changes in the new php.ini file. Then restart PHP5-FPM and Apache. During the installation process, the Google modspdy repository is automatically added to your system. Updating modspdy is as simple as updating other Debian packages. First update your droplets package list. Then find and update any packages that are in need of updating.